Censorship is in the news again. Start out your Saturday by reading Pat Scales’ great article about Common Sense Media, Three Bombs, Two Lips, and a Martini Glass. Then bring yourself up to speed on the censorship battle surrounding the Teen Lit Fest in Humble, TX. My friend, Ellen Hopkins, was disinvited to speak after complaints about her books. Ellen blogged about it . Several other YA authors who were scheduled to appear at the festival decided to boycott the event to show their support of her. Take the time to read Tera Lynn Child’s letter to the superintendent, and Matt de la Peña’s explanation about why he joined the boycott, Melissa de la Cruz’s decision to do the same thing, and finally, Pete Hautman’s blog post about why he won’t be speaking in Humble, either. I am furious that officials removed Ellen from line-up. I respect the decisions of the other authors to show solidarity with her by withdrawing from the event. I’ve thought long and hard about my opinion about the boycott and if I should join the conversation. While I was running Thursday evening, I finally found the answers I’ve been waiting for. I don’t think a boycott is the most effective way to deal with this issue. Again – I have only respect and fondness for Ellen and mountains of appreciation for her work. She writes honest books about hard things – the kinds of hard things that kill our teenagers. Kids need her books. Her books save lives. But this is one of those situations where friends have to agree to disagree. Because I think that the boycott removes the opportunity for the other authors to speak up. Intellectual freedom thrives when there are conversations. Censors hate that kind of thing. They seek to deny intellectual freedom and cut off conversations. 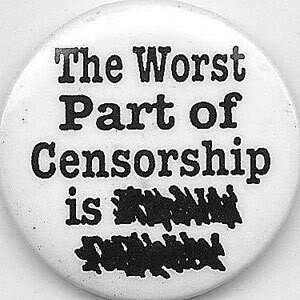 When a censor sees something that is scary, their response is to ban it, shut it down, take it off the table. Teenagers particularly need the chance to talk about hard things because they are developing their moral codes and have to sort out their own sense of what is right and what is wrong. That’s why I am such a supporter of Ellen’s books. That’s why I write the kinds of books that I do. My concern about the boycott is that it takes away the possibility for discussion. Not with the people who banned Ellen and her work. It’s clear that they are not interested in conversation of any kind. (Shame on them for their cowardice.) But by boycotting, the other authors lose the chance to speak up about censorship to the audience that deserves it the most – the teens in Humble, TX who have been denied the chance to talk to Ellen about her work. That’s what I would have loved to see happen: turn the Teen Lit Fest into a day of talking about book banning, and censorship, and the precious right we have of intellectual freedom. It would be cool to hear how the teens of Humble TX think that censorship should be confronted. Todd Strasser has written about his decision not to join the boycott. I hope the kids who attend his sessions can have great conversations about the insidious evil that is censorship. TEACHERS AND LIBRARIANS!! You have a golden opportunity here!! Make this whole mess part of your discussions during Banned Book Week (Sept 25 – Oct 2) and Teen Read Week (Oct 17 – 23). Feel free to disagree with me in the comments. (No name-calling, please.) Feel free to agree with me, too. But do your fifteen minutes of writing first, OK? Set… turn down the shouting voices of opposition and take a few quiet moments to center yourself. Today’s prompt: What things does your character believe in so strongly, that she is willing to fight for them? Write a scene in which this belief puts her at odds with someone she cares about. OR What are you willing to fight for? What are you secretly a supporter of, but you are looking for the courage to speak up about? Thanks for the links and sharing your thinking about this issue. When I was a middle school teacher, I hung the ALA’s 100 Most Banned Books list near the door of our classroom. It was one of the fastest ways to get kids to read — tell them all the books adults think they shouldn’t be “allowed” to read! It also led to great conversation as they tried to figure out why some of the books were on the list. When I started reading your blog, I was thinking…”Good! The other authors are standing up for her and I hope their event is a disaster due to their small minds!” As I continued to read, my eyes were opened, as well as my mind. I hadn’t thought far enough ahead of my initial reaction of anger to see the opportunity this provides. You are absolutely right about this opening the door for the authors who do attend to have courageous conversations with the kids and any adults who attend. As a middle school teacher, any book that gets kids reading and talking is a good book. Any book that causes adults to take notice and helps them connect with teens is a fabulously important book. You, and many of the authors you mentioned, write those important books and it is a shame this community is so afraid to allow those conversations to occur. It is their loss! As a literacy specialist/reading coach for my small school district, I want kids to read for the love of reading. So many of my students have such rough, terrible lives at home, and the world within the book can be a great escape; the story is a “See, your life isn’t so bad. It could be much much worse. Aren’t you so lucky?” Teen lit can help those students feel “normal.” The parents of those “fortunate” teens–you know, the ones who have three meals a day, a warm bed, structure, routine, goals–typically are the ones who do not like those books which end up banned from schools. It’s a hard battle to fight….It seems the best way is psychological warfare: These books can present the worst senerio, but it’s what the happens to the characters, the teens, that tell the best story. Teens may learn more from the bad example and the consequences of the actions, than from the good examples. Every year Banned Book Week is a great sourse of conversation in my classroom. Students are stunned when they see many of the titles on the list. The timing of it is even better–the beginning of the school year when classroom communities and values are being established. This topic isn’t forgotten as the year progresses, but rather revisited often. I like your way of thinking about the boycott; instead of just “chiming in” on a topic, we should take the time to think critically about it and then discuss both sides. Isn’t that what we want our kids/students to do?! Thanks for this. Since I heard about the controversy at the Teen Lit Fest in Humble, TX, I’ve been trying to figure out why the idea of a boycott bothers me. While I think that what happened to Ellen Hopkins is terrible, I’ve had an uneasy feeling that the boycott is hurting the wrong people. I can’t imagine that those who prevented Ellen Hopkins from coming care in any deep way that the Teen Lit Fest has been badly damaged. After all, the superintendent is on record proclaiming that writers are essentially interchangeable. But the ones who will be most affected by the boycott are the ones who were looking forward to the chance to meet and hear authors that they care about. And these people were not the ones who disinvited Ms. Hopkins. Your idea of having the invited authors discuss censorship is brilliant. Came across this post via Twitter today. This is really a discussion that students need to be having. I’m bookmarking this post (with all it’s great links) for my AP Language students. They will love to debate this. Thanks for bringing the issue to my attention. In my opinion, the boycott works only if the people of Humble, TX demand that those in charge of the festival re-invite everyone including Ellen. Those who have decided to support Ellen by not attending are saying something with their absence. And those who decide to attend can support Ellen and speak out against censorship in their own way. Thank you for writing such a thoughtful response to this horrible issue. After taking some time to read through the blogs of the protesting authors and reading your entry, I have to agree with your perspective. This really is the perfect opportunity to discuss censorship with teens and listen to their thoughts on this manner. As a teacher, I’m looking forward to discussing this with my students and with my school book club. Thank you again! There are many troubling things about the Humble, Texas case. At the moment, they seem to be under total lock down. Their facebook page is gone, and they are talking to no one about this issue. I’m quite sure that the Superintendent has ordered this. The same Superintendent that had Ellen uninvited. The part that troubles me the most is that this entire issue was fueled by a middle school librarian who should know, by her training as a librarian, that kids should have a choice in the books that they read. It appears that the Teen Fest gives kids that choice. Ellen Hopkins had been to Humble, Texas in the past, and the visit was successful. So, why did this middle school librarian feel compelled to have her uninvited? Todd Strasser knows first hand about free speech, and I think that he will do a terrific job of helping the teens of Humble, Texas understand what has happened here. Perhaps he can do it better than their teachers and librarians, My bet at the moment is that the Superintendent is allowing the teachers and librarians to talk about it. So, go forward Todd. These kids need you. Thank you! I have a correction: My bet is that the Superintendent isn’t allowing the teachers and librarians to talk about the issue. I think there is room for both actions. A boycott raises awareness. I certainly wouldn’t have heard about it otherwise. Outside pressures can certainly influence small minds, especially if the teens who are missing out let their voices be heard. I think censorship and civil disobedience are vital lessons to be learned. I am writing this from Berlin where in my neighborhood Albert Einstein lived for many of his vital years until he was driven out of the country. His exodus certainly helped raise awareness in certain communities that knew little of the coming dangers. But to your point, on the next block, JFK stood and gave his famous speech, giving hope to many Berliners. Thanks for providing your thoughts. I think either way, there is no doubt what the focus of the coming festival will be. And it will be exciting to see. Thanks for this, Laurie. I never meant for this to turn into some kind of circus. I am sick about the whole thing and truly fear for the librarian who invited me in the first place. I hope her job is secure I’ve mentioned a few times in the past days that no one from the festival bothered to come to me and ask what I’d talk about–journey to bestselling author. Reaching for your dreams. Writing process. Poetry. Memoir vs fiction, etc. All someone had to do was call! I do hope it leads to many classroom discussions about censorship and banned books and the importance of literature in keeping free speech alive. Not to mention communication. All someone had to do was call. I admire the participating writers who stepped back from the Humble Teen Lit Fest. The protest is a civil one. The readers of these authors will be disappointed (just as customers are affected by a Union walkout in the auto industry), but the objecting community who sought to censor will be reminded that this is no small issue to those involved. They might think twice next time they blithely feel like they want to decide who is in and who is out. I feel badly for the readers of YA who will not get to see their favorite authors speak, but I also think the public should have had more say. Maybe they will take advantage this disappointment to reschedule a different lit fest in which Ellen Hopkins IS welcomed. But doesn’t the boycott draw attention to the censorship case, rather than allowing the Humble folks to sweep it under the rug? If Ellen had taken this silently, we wouldn’t have known about the case. If the other authors hadn’t joined the boycott, the national media wouldn’t have shined a light on the dirty business. Would we be having this conversion? It’s good that some authors remain on the guest list to speak out, and I hope they do. David, I agree. I’ve also posted a comment in response to Matt. Boycotts do also serve a purpose and bring national attention to an issue that might have remained local if the authors had agreed to go to the festival. What about the Montgomery Bus Boycott and the history of civil rights? Pretty persuasive. Boycott of apartheid in South Africa? I am a thirteen year old girl and I read Ellen Hopkins book “Tricks”. I didn’t know what it was about when I started to read it. I just knew that Ellen Hopkins was an author I had read before and enjoyed. I immediately fell in love with Tricks. It’s an amazing book but I do think that anyone younger than me would not be ready. That doesn’t matter, though, because it’s a TEEN Lit Fest and anyone younger is not a teen. I think the way she dealt with the subject matter was good because it did not describe too much but she definitely told the truth and got out her message. Maybe I am more mature than other people my age but I don’t really think so. I think censorship is completely unfair and there is nothing wrong with being exposed to things because it helps you deal with things in real life. It helps you draw connections and see how other people have dealt with it. I tend to agree with you, Laurie, though I also understand the other side of it, and the power of boycott to bring attention, like David said. Having seen firsthand what Ellen’s books mean to kids…it’s amazing, it’s moving. Another cool option would be attending and then each author reading something from Ellen’s books in their presentations by way of protest. Bottom line: my hope is that the other authors felt free to decide either way without feeling like attending was a vote FOR censorship or AGAINST Ellen. Part of intellectual freedom is each being free to express support of it in the way that makes sense to each. I know that if I’d been part of the festival, attending vs. not attending would be a hugely tough call for me. Sara, what a great idea! For the writers who attend to read something from one of Ellen’s books. But, this is what could be happening now. I do think the Superintendent is having all these sites monitored. I hope that I’m wrong, but I think that he will put demands on the writers who choose to attend. I think that he will tell them to not talk about censorship, or Ellen’s books. Of course, once they are speaking there isn’t much that he can do about it. I believe that freedom of speech doesn’t exist in the school district of Humble, Texas right now. I don’t think that teachers and librarians are allowed what the Constitution affords them if they want to keep their job. I hope that between now and Jan. things change so that Todd has a “free” venue to talk about whatever he chooses. As a high school English teacher, I have a very strong opinion on censorship. In fact, I even teach a unit on censorship when we read Fahrenheit 451. Thank you, Laurie for bring up a valid point about a boycott. Silence will not educate. People need to be heard for change to happen. But, as far as reading Ellen’s work aloud, this is taking censorship to the extreme and FORCING people to listen to something they may not want to listen to. You are missing the point on censorship which is having a choice to be heard. Just because the literature is out there, doesn’t not mean that everyone should be exposed to it. As a teacher, if something is controversial, I send a letter home. Parents can opt their children out of that book and have them read something else. While I may not understand why they don’t want to read it, I do respect their right to not read it. And it is their right to not have their child read it. What they don’t have the right to do is to deny ALL students from reading something. What we need to remember about censorship (and what Humble has forgotten) is that censorship involves a choice and Humble has taken that away. One author took a stand. Thank you for posting a different view on the topic. I had the same feelings you did upon reading so many other authors were pulling out. I was conflicted – glad they were willing to stand behind Ellen and withdraw, but at the same time, sad for all the fans who were looking forward to meeting them. Maybe, though, if enough authors pull out, the festival will be a failure – sending a message to the people in charge. I wonder, though if all the authors did attend would a censorship discussion even be allowed? Or would they be expected to follow a certain set of “friendlier” topics? To Ellen – I understand that you feel sick about this “circus” that you feel you created, but in all honesty, it is an ongoing issue that unfortunately you have been thrown into the middle of. I applaud you and everyone who is willing to stand up for their beliefs! It is NOT an easy thing to do and quite often does give you that sick feeling. On our blog we want to delve into this whole idea of censorship and banned books with the hopes of opening the eyes of others in an intellectual way. The best thing to come out of this is that it opened up so many discussions about what censorship is or isn’t…. and reminds us that it still very much is. When we don’t talk, don’t communicate, we become pawns in a bigger game. On Laurie’s Facebook post, I mentioned fear, and how it is driving us into our dark, little caves. We move beyond fear by communicating, and by coming to understand that we are more alike than not. It’s okay for us all not to believe the same way. But if we never look at the other side, how can we really know why we believe like we do? Knowledge is power. Seeking knowledge can only make us stronger. If all the other authors (myself included) had chosen to attend the festival it could certainly have lead to a healthy discussion about censorship within the context of one group of people. But by NOT attending the festival (creating awareness) my hope is that it prompts this same conversation among MANY groups of people. That’s a good point, Matt. I agree with Matt and support the authors’ decision to boycott the festival. I believe that boycotts have served a useful purpose throughout history. Take South Africa and apartheid, for example. I agree wholeheartedly with you Laurie. Truly, I don’t understand why some literature is banned here. Its America!! Freedom of the press!! There should be a protest…..or readers in Humble should bring to the Fest their artwork or poetry or essays on their love/need for Ellen and her books…..show ’em. Such a sad situation. I have a lot of empathy for Ellen and her devoted readers in Humble. It’s stupid that they would take Ellen Hopkins out for what she writes. I am 15 and I’ve read all of her books. What she writes is dreadful to even think about but the fact that she can make such vivid and harsh images in readers’ heads, just means she’s a breathtakingly amazing writer! She should not have been un-invited. It is not that they just didn’t invite her. They uninvited her. That’s just rude and shows that the board is too dumb to know her books. I agree with the boycott because if I was an author I would too. Are there that many authors as good as her? If she doesn’t deserve to be there than who does would be how I’d feel if I was an author. Today’s post and writing prompt reminded me that as a society we fear the unknown. It also reminded me of the decision I made in 2005 when a well meaning adult gave false information about why my infant grandson died of Sudden Infant Death Syndrome (SIDS). I soon realized the damaging prevalence of false information and how it affects surviving families. I wrote FLYING HUGS AND KISSES because I wanted to help families with children heal by not only having correct information about about SIDS but to give sibling grief and loss a supportive voice. Banning books appears to me to not accomplish what the person who bans sets out to do. It does the opposite. As soon as someone says don’t read it, then more people want to read it. That is what reviews are for; to help the consumer decide if the book is for them or their children. Let the process do its job. I’ve been thinking and thinking about this, and I think that “boycott” may be the wrong word here, though it’s the one being used in all the discussions I’ve seen. Because it’s a boycott is when groups of people refuse to purchase or consume a product, but it’s a strike when the producers of said product refuse to produce that product. So if large numbers of students and their parents had decided not to attend, that would be a boycott. But writers deciding not to appear and give speeches there–I think that’s a strike. Which at first sounds like a subtle distinction, but I find my thoughts about a boycott and a strike are not quite the same. For a boycott, the first questions many people ask are about effectiveness: will this work, and will it make a change. For a strike one asks (or I ask, anyway) subtly different questions: whether the conditions under which the workers are being asked to work or the things they are being asked to support in doing so are, in fact, unreasonable or unjust, and whether they in good conscience needed to refuse to work. So if I think of it as a boycott, I support choosing not to attend, but I do so a little ambivalently. But when I think of it as a strike, I find myself feeling more strongly that, yeah–if it were me, I don’t think I could in good conscience show up for and essentially help run an event that had acted in such a way. Workers in all manner of industries that support the public good find themselves needing to walk out from time to time, both to fight for better terms for themselves and to fight for conditions (sensible hours and workloads) that affect the safety and well-being of those they’re serving. And I think this is more similar to that sort of a strike than to a decision simply not to buy something from someone whose policies one finds distasteful. First off, I believe it should be illegal to ban books. We have the choice of freedom of speech, so why can’t we write whatever we wish to. Banned books have story to tell that deserves to be told. If an author puts effort forth to create a four hundred page book, it deserves a place on the shelf, no matter what it is about. Besides, don’t these books teach a lesson? Do you not learn about things from all books? Do you not learn about characters who have struggles and how they overcome them? Do these books not inspire anyone who is going through the same problem? Books that are banned have a close range in being real-life. They show problems people deal with in real life, such as the Ellen Hopkins series. I have not read it, however I have heard about the books from some of my friends who did. I have also heard the summary of the first book in the series Crank. I can guarantee that some teenager is going through the same problems as the main character is. So do they not deserve to be known either? If you ban a book that deals with a serious problem like Crank does, then it probably makes those teenagers feel the same way about their lives. Of course I’ve never experienced something like that, however I know how teenagers act/feel. I believe that boycotting the event brings attention to censorship, however I believe like Laurie said, it can also be a chance to bring attention to censorship. So I’m on the fence about that issue. Ironically, I’m listening to a song about war while typing this. I guess the book banning is like a war. You have people who want to fight for the freedom for stories to be told, while others are trying to protect the public from knowing about books like this. I think both approaches will stimulate the conversations that need to happen. I also believe that since authors are employing both stances AND supporting each other in either stance that is chosen, this is also a great example of tolerance and choice which will cause other exciting conversations to take place. Well done, from what I’ve seen so far, by both camps. Because in the end they are coming together for the same thing. I think there is some really exciting stuff happening here. I’m so sorry that Ellen is upset-understandably so, because I see some necessary empowerment happening here with her as the kick-board. Laurie thank you, your’s was the first opposing view I’d seen and I think you’ve got valid points. I know I’m repeating myself, but it is exciting to see a cause bolstered by two different ways of protesting, and there is support and respect for both sides. This is how kid’s authors rock it hard! I’ve been in this community now for over ten years and this is how kid’s lit, which includes YA, is going to rule the world! Being from around Humble, TX myself and looking forward to their Teen Lit Fest this year, I went to Ellen’s blog and sent (what I would consider to be) a very strong e-mail to Mr. Sconzo. I’m really hoping that he reads it and takes it into consideration what he is doing by banning this wonderful, talented! writer from his own students and those in the surrounding Houston area. Ellen says she most certainly will be stopping by the Spring/Humble/Houston area in the spring on her own, but I do hope he will reconsider and allow her at the festival because, quite frankly, she’s the highest profile author that’s been scheduled to make an appearance with a style I feel is more unique than the other authors. What he’s doing is just absurd and I’m surprised any librarian would censor another writer. This is definitely not going to be a matter he will be able to ignore. I’m thinking many of Humble ISD’s students and teachers will have a good deal to say about all of this when school reconvenes on Monday! When I heard about all of this, I was sick in my stomach. As an elementary school librarian, I use Banned Books Week to talk to my students about censorship and how dangerous it can be to a society. I haven’t read Ellen’s books yet, but they are on my to-read list. I know enough about them to understand why some would get upset. However, I also understand how important they are to the teens that read them, and I feel that this uproar is just adding to the importance of her books. I completely understand why these other authors have chosen not to attend the festival, but I think I feel as you do, Laurie. I’m not sure this is the best thing. I feel that way because I feel that in the end, it’s the teens who are being shorted. Yes, there will be more attention drawn to it because of the “boycott”, and yes, there may be great conversations among lots more people than there might have been before. But the bottom line is that the teens who are attending this festival are not going to get to benefit from meeting these authors that they love so much. I do feel that their ability to discuss Ellen’s situation with these other authors may have been incredibly helpful, and is something that can still happen with the authors who are attending. Again, totally understand both sides of the boycott issue and not trying to say that the authors who are choosing not to attend are wrong in any way. I just feel like the teens might be getting the short end of the stick. Overall, this whole issue is so sad and alarming to me. One of my favorite quotes is one of yours, Laurie: “Censorship is the child of fear and the father of ignorance”. This is just another example of how true that statement is. Asking Ellen to not attend the festival is NOT going to stop teenagers from reading her books. In fact, it will probably have the opposite effect. One of the craziest things about all of this is that the organizers may have found that having Ellen there to explain and discuss her books may have made a bigger positive impact on the community than dis-inviting her could ever have. Censorship is so ugly. I just don’t get it. What I do get is the importance of have a great selection and reconsideration policy in the district. It’s been awhile since I have a challenge at my school (Stupids Step Out by Marshall my first year, followed by challenges with the books in the human growth and development section.) But I am fully prepared to fight for the books in the library based on the selection policy of our district. Having conversations about selection and book choice is so critical. I use Banned Book Week to talk about the First amendment with fifth graders. They are always SO shocked that books have been challenged. It is one of my favorite topics to teach. Handling parent concerns so that it doesn’t not end up in a challenge is always tricky. Two years ago, I had to listen to a parental complaint about Harry Potter. It took a couple chats but she finally relented (but her daughter was not to check the books out). What is happening in Texas is revolting. Ellen Hopkins’ books are so amazing and are much needed in today’s world. Can you see I had lots to write about today? This is a hot white topic for me. Hrm…gives me pause regarding some of the folks in Humble, TX. Supt. whatshisname demonstrates very little confidence in the strength of his educational system if he takes on doing their thinking for them without even having taken the time to think for himself. Downright scary, that. And what will show for it? All those brilliant teens will just make sure that they absolutely read every one of Ellen’s books as fast as they can get their hands on them. He might uninvite her from the LitFest, but man, does he realize how many books he just sold for her? The surest way to make something happen is to tell someone it can’t be done! Ellen, you go get ’em, Girl! That supt. has made some hungry-for-books kids, and not just in TX! You won’t have time to go to that conference–you gotta get writing some more books! I have mixed feelings of how to show support in our fight against censorship. I believe in open discussion of issues and agree that without authors to talk about books being censored, our young readers are the losers. I can also see how withdrawing can be beneficial, too. More news is being created because of those who in showing their support, withdrew. Hopefully, we have enough authors left who can speak about the issue. I knew your stance on censorship Laurie, but it’s awesome to see other peoples’ reactions to it too. I proudly carry around a handbag that says I Read Banned Books (from the ALA website, check it out here: http://www.alastore.ala.org/detail.aspx?ID=483 ) and just thought I’d spread the word on the cool bag (only $12!) It’s led to many a cool conversation. Also, Laurie, I must thank you for your encouragement with the WFMAD challenge. I’ve finished my WIP by working about a half hour every day. 🙂 Revision time, here we go…. Such an interesting post and subsequent discussion! My partners at StorySnoops and I would like to weigh in on this important topic. Our site offers children’s book reviews from a parent’s perspective, but purposely does not assign ratings since one rating system doesn’t fit all when it comes to children. Our mission has always been to instill the love of reading in young readers, and we support every effort to ensure that they have unlimited access to books. Even though the event that has prompted this most recent discussion is a frightening one, we couldn’t agree with you more about the value of public discussion. We’re looking forward to a short interview with Ellen Hopkins on our site during Banned Book Week and are eager to hear her further thoughts on the subject. Loved this post. Especially reading everyone’s comments. Thank you, Laurie, for starting the discussion. As for the prompt, I enjoyed pitting my MC against her parents as she fights for what she believes in. Learned a bit more about her as well. Previous PostPrevious Mad Woman in the Forest tee-shirts, anyone?